Learning to play the guitar should be fun! It's more fun to learn by playing songs. I teach adults, teens, and kids. I encourage non-playing parents to actively participate with their kid's lessons. My teaching style is to use patience and positive reinforcement - similar to Suzuki method violin instructors. I start with songs and teach a little theory all along the way. I teach things I wish someone had taught me when I was learning: chords (simple, power, barre), patterns (solo, rhythm, shuffles), songs (accompanyment while singing, performing, improvising), useful theory (chords, numbers, transposing), and music reading. Lessons are usually 1 hour per week. 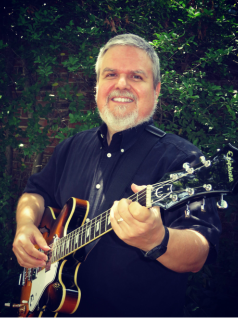 In addition to being a professional guitar instructor, I am also an attorney, a qualified mediator, a graduate-level mediation trainer, a member of the band -Panther City Rounders, the Executive Director of Community Music Connection, a licensed pilot, and a devoted husband and proud father.